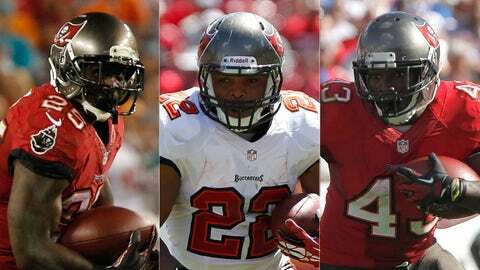 Tampa Bay Buccaneers starting running backs (from left): Mike James, Doug Martin and Bobby Rainey. TAMPA, Fla. — By the end, they were almost unrecognizable. The Tampa Bay Buccaneers’ backfield took on three lifetimes last season. First, Doug Martin failed to recapture the spark of his rookie season because of defenses’ heightened emphasis on him, before he went down with a torn labrum in his left shoulder. Second, Mike James showed flashes of skill in Martin’s absence, before being sidelined with a broken left ankle. Third, Bobby Rainey became a surprise with a few breakout performances after his arrival from the Cleveland Browns, before he was bottled up in the season’s final month. "Health" and "consistency" should be words to pursue for running backs in the first year of the Lovie Smith era. Last season, with a revolving door in the backfield, the Bucs averaged 100.8 yards rushing per game, 22nd in the league. Still, those numbers could prove deceiving. A quick revival is possible. "I feel fortunate that we do have a good, solid group of runners that have been together for a couple years," Bucs running backs coach Tim Spencer said. "I like what I see. The cupboard’s not bare, so (selecting a) running back won’t be one of the things that will be real big in this upcoming draft. … I have some players to work with, there’s no question." Doug Martin — His sophomore season was much different than his rookie year. Martin, named to the Pro Bowl in the 2012 campaign, burst onto the scene with 1,454 yards rushing with 11 touchdowns his first year in the league. But he was no surprise to defenses last fall in being held to 456 yards rushing and one touchdown in six games. He was placed on injured reserve in November after sustaining a torn labrum in his left shoulder during a loss to the Atlanta Falcons in Week 7. The Bucs’ offensive line struggled to open holes for him early in the fall, and the inability of Josh Freeman and Mike Glennon to stretch defenses with their arms downfield made Martin’s job that much more difficult. Expect bigger things from him in 2014. Mike James — He was a late-round addition in the draft who showed promise in Martin’s absence. James, a Miami product taken in the sixth round, finished with 295 yards rushing before being placed on injured reserve with a broken left ankle sustained in a victory over the Miami Dolphins in Week 10. His workload increased dramatically after Martin was injured. James had 14 carries for 45 yards against the Falcons in Week 7, 10 carries for 39 yards against the Carolina Panthers in Week 8 and 28 carries for 158 yards against the Seattle Seahawks in Week 9. He had five carries for 41 yards against the Dolphins before being carted off the field with his injury, an abbreviated end to a promising start to his NFL career. If he stays healthy in 2014, he’ll provide quality depth behind Martin. Bobby Rainey — He was claimed off waivers in October after Martin’s injury and produced moments of impact. Rainey became the talk of Tampa Bay — particularly within fantasy circles — following his 163-yard effort in a victory over the Falcons in Week 11. He had 127 yards rushing in a victory over the Buffalo Bills in Week 14, but he found room hard to come by in the season’s final three weeks. To close the year, he had no more than the 37 yards rushing he totaled in a Week 16 loss to the St. Louis Rams. He finished with 532 yards rushing with five touchdowns as part of Tampa Bay. 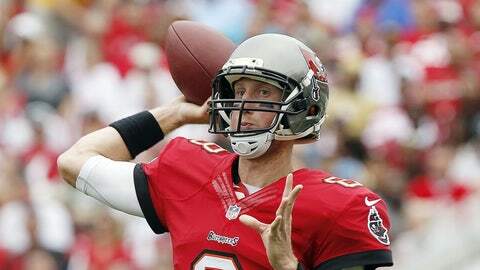 His struggles were a large reason for the Bucs’ offensive inefficiencies late. Brian Leonard — He was the Bucs’ choice in short-yardage situations. Leonard had 182 yards rushing, the most since he totaled 303 with the Rams during his rookie year in 2007. He was never as agile or effective as Martin, James or Rainey. But he served a defined role as a situational runner. Jeff Demps — He was brought to Tampa Bay as a utility player in the trade last April that sent LeGarrette Blount to the New England Patriots. Though the track star has noticeable speed, he was used sparingly in the backfield, finishing with one carry for 14 yards gained in a loss to the Arizona Cardinals in Week 4. He also had two catches for 13 yards in a loss to the Philadelphia Eagles in Week 6. If Martin and James stay healthy, the Bucs should be set here. Clearly, Martin is the Bucs’ answer at running back, and new offensive coordinator Jeff Tedford should work to make the jitterbug runner a dangerous pass-catching option as well as a rushing threat. It wouldn’t hurt to build depth behind Martin and James, though. Toby Gerhart, who had 1,305 yards rushing in four seasons with the Minnesota Vikings, could serve the short-yardage role well. It’s hard to see the Bucs spending an early round pick at this position. They’re not in the market for an elite runner — the new regime is excited about Martin’s potential — and it would be a waste to spend a pick on this position when there are other needs to address first (possibly a defensive end, a quarterback, offensive-line depth and a third wide receiver). Still, someone like Wisconsin’s James White or UCF’s Storm Johnson could be worth a glance in the fifth round or later. Injuries decimated the Bucs’ running back depth last season. Losing Martin was a significant blow, of course. But having James go down as well didn’t do Tampa Bay any favors. There is blame to go around for the Bucs’ lack of run-game efficiency. The offensive line struggled to produce a constant push, aside from a mid-season spike when Tampa Bay won four of five games from Weeks 10 through 14. Keeping Martin on the field should be the Bucs’ main concern next season. Placing the promising talent on IR last year was the right move for his future. If the new offensive staff can be creative in the ways they use him, he should recover next fall.